Tomorrow brings us another cool event for women’s history month. 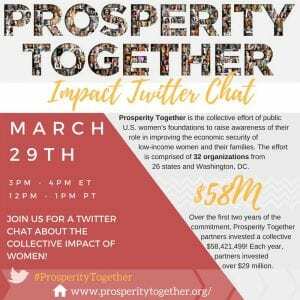 From 3 pm to 4 pm EST tomorrow, Prosperity Together will hold a Twitter chat to celebrate the collective impact of their funding. Prosperity Together is the coalition of 32 women’s funds across 26 states and Washington D.C., which has invested $58 million since 2016 for grassroots organizations growing gender equality and economic security for women. 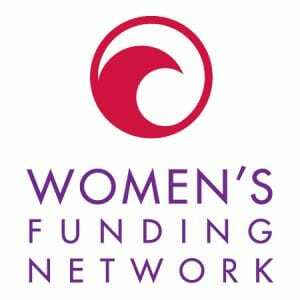 Philanthropy Women will be there tomorrow, to hear about how these women’s funds are pushing for social change, particularly by using participatory grantmaking strategies and paying extra attention to diversity and inclusion. Women’s funds are also doing some of the most groundbreaking work with supporting youth-led grantmaking and youth-led social movements, so it will be great to hear more about that, too, since we are living in the midst of the largest child-led social movement in America, the movement for gun safety. This twitter chat will be a unique opportunity to hear from women’s funds about exactly how they are investing with their grants, and how these investments are paying off in gains for women and girls. The hashtag for the event, #ProsperityTogether, will help readers follow the conversation. Be sure to use the hashtag in tweets that you post, in order to add your voice to the conversation.